A single stone pendant is a very versatile piece that is suitable both for everyday wear, and for a special occasion, and it dresses up any outfit it is paired with. 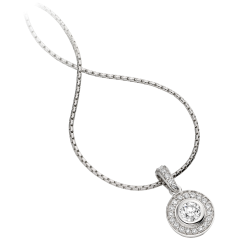 The single stone pendants you find on our website are set with beautiful round Brilliant cut and Princess cut diamonds. If you are planning to buy a single stone pendant it is important to also look at the type of setting in which the diamond is secured, as this will also impact the overall look of the pendant. A claw or a tension setting lets more of the diamond show, while a rub-over setting completely surrounds the diamond. Some consider that a rub-over setting makes a single stone pendant more substantial, and others prefer to see as much of the diamond as possible. It is a matter of personal preference and we are happy to oblige both parties. We offer single stone pendants with claw, rub-over, tension, and rub-over and claw settings. When selecting the size of your diamond pendant there can be several aspects to influence your decision. Depending on your height the diamond in a single stone pendant will seem smaller or larger, for instance a smaller diamond worn by a petite person appears larger. We know that budget is an important factor when purchasing diamond jewellery, for this reason we try to offer our single stone pendants within a wider range of price categories, with more affordable options. You can also decide to purchase the single stone pendants from our collection with or without the matching chains. Each single stone pendant and necklace is made out of 18ct white gold or 9ct white gold.